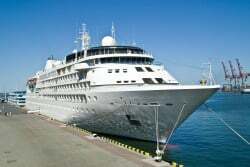 Explore the Great Pyramids and the Egyptian Museum of Antiquities while your ship is waiting in Alexandria Port. Egypt has so many amazing options for tourists that a big part of the challenge when arranging your visit can be deciding what not to do. But at Osiris, we are here to help. A Mediterranean cruise is a unique experience, and when your ship docks at Alexandria you’ll feel as if you are entering another world. You may have thought that you and your traveling party might have to miss out on visiting Egypt’s iconic monuments near Cairo, most notably the Great Pyramids on the Giza Plateau, but think again. Osiris offers an exclusive pyramids day tour from Alexandria, and just a three hour away by private, air-conditioned luxury transport, it should be on the itinerary of every visitor to Alexandria. The pyramids day tour not only offers a unique chance to admire the pyramids and the ancient city of Memphis, but also allows plenty of time to wander around the legendary Cairo Museum, home to the mystical golden funerary mask of King Tutankhamen, mummies, treasures, sculptures and many other artistic wonders of the ancient world. With your very own private luxury vehicle, complete with experienced driver and passionate, talented Egyptologist, one of Osiris’ most popular Egypt tours will leave you spellbound by both the country’s unique and magical history and the beauty and splendor of her world-class monuments. 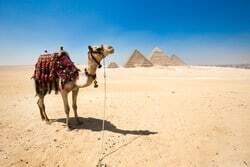 Enjoy a personalized day tour to the Great Pyramids with a private Egyptologist guide, driver, and traditional Egyptian cuisine. Your day tour will be customized for you and will suit your needs and your schedules. Avoid the crowds with your own private guide & private vehicle during your tour around the Great Pyramids and Sphinx. 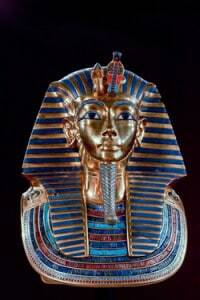 Discover the Egyptian Museum and secrets of King Tut with your own private Egyptologist guide. You will be picked up upon arrival in Alexandria port by your private guide and private car and head to Cairo. Arrive in Cairo and explore the Great Pyramids, ancient Memphis, Saqqara, the Solar Boat, Chephren Pyramid, and the famous Sphinx. Learn about the Great Pyramids of Giza and how they were covered with casing stones. The casing stones were made of highly polished limestone. The ancient Egyptians covered the Great Pyramids with casing stones so it can reflect the sun’s light. The reflected sun’s light with the casing stone made the pyramid shine and look like a jewel. The original look of the Great Pyramids with its shining casing stones would act like huge mirrors and reflect light so powerful that it would be very visible from the moon as a shining star on the earth. 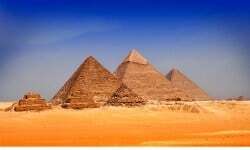 No wonder why the ancient Egyptians called the Great Pyramid “Ihket” which means the glorious light. 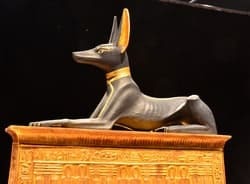 This tour includes a private vehicle with driver, a trained Egyptologist, and entry to the Chephren (Khafre) or Menkaure (Mycerinus) Pyramids, as well as the Solar Boat. A buffet lunch at a great local restaurant is provided after visiting the Great Pyramids. After lunch, discover the Egyptian Museum of Antiquities and its Mummy Room with your private trained Egyptologist guide. 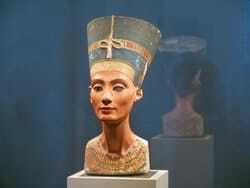 The museum holds the tomb of King Tut, Egypt’s most famous boy King. After the end of the tour, your private guide and private car will take you back to Alexandria port.